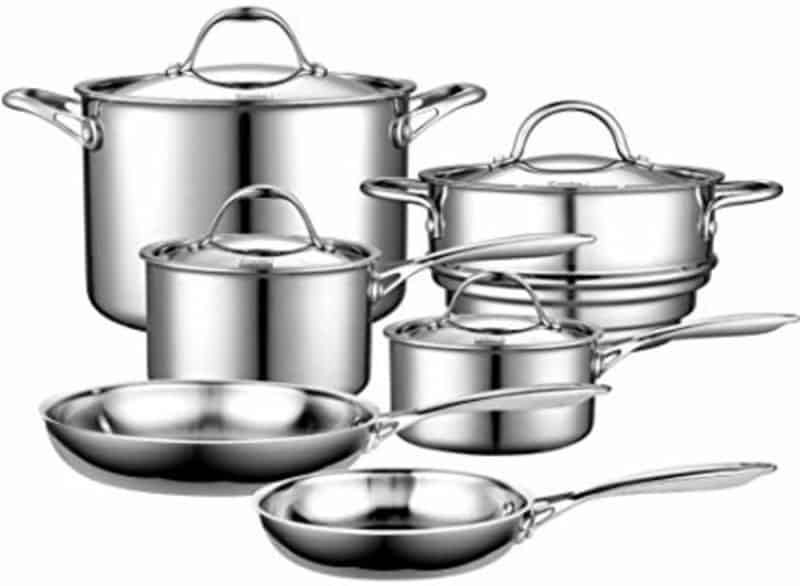 Finding the best stainless steel cookware can be difficult. Sometimes you may think you’ve come across a safe, convenient, and sturdy set of pots only to find out that they don’t have the best quality non-stick surface or that they contain toxins. For many, these are deal breakers. But of course, there are always those folks who don’t mind where their cookware comes from or what materials their cookware is composed of. Even then, most want a quality stainless steel cookware set that isn’t going to scratch or rust, even with finicky maintenance. If you’re all about quality, you’ll find our list of stainless steel cookware relevant for you. I’ve listed only the top stainless steel cookware to date with varying price ranges and different-pieced sets, something for everybody. Coming to number one on this list, here is stainless steel cookware at Macy’s, the All-Clad 7-Pc Cookware Set. You won’t find this set anywhere else. But unless you’re okay with spending $629.99 ($775 value), you might want to skip on this product. All-Clad is a higher-end company offering high-quality, American-made, premium cookware. This set offers a gorgeous mirror finish and is conveniently dishwasher safe and induction cooktop-friendly. This set’s highly conductive, three-ply stainless steel and aluminum bonded surface is said not to react to food or impact your food’s flavors. 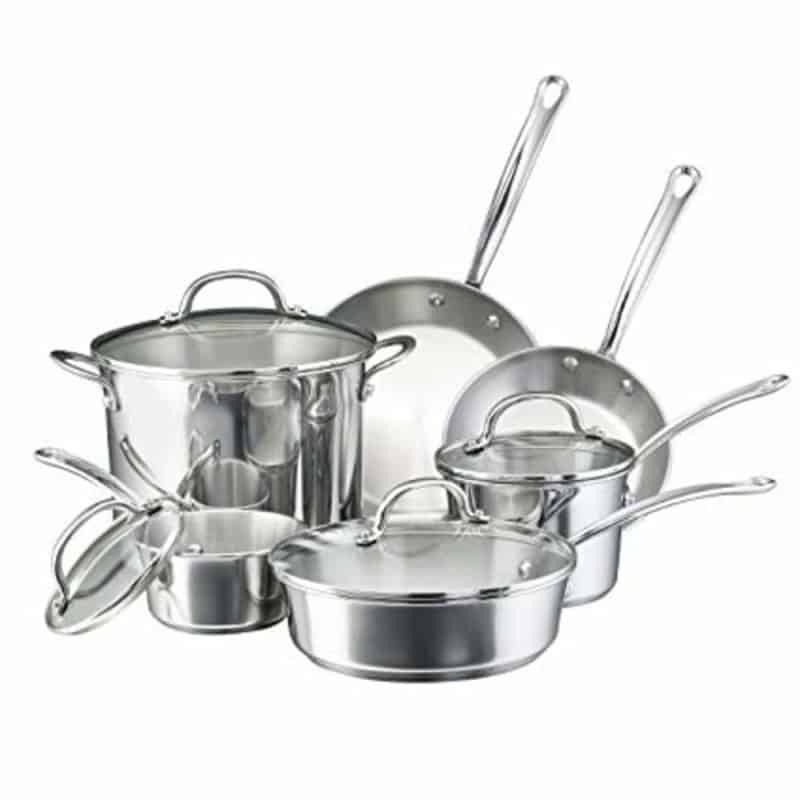 In general, not only is this All-Clad stainless steel cookware 7 piece set attractive, it’s also sturdy and easy to clean. Along with your purchase, you’ll receive a lifetime limited warranty. (For the price, this is heavily appreciated.) And as a bonus, Macy’s will generously throw in a Stainless Steel 15” Oval Baker & Pot Holder Set, also by All-Clad, which is oven safe up to 600-degrees Fahrenheit, dishwasher safe, and can hold up to 15 pounds of food at a time. 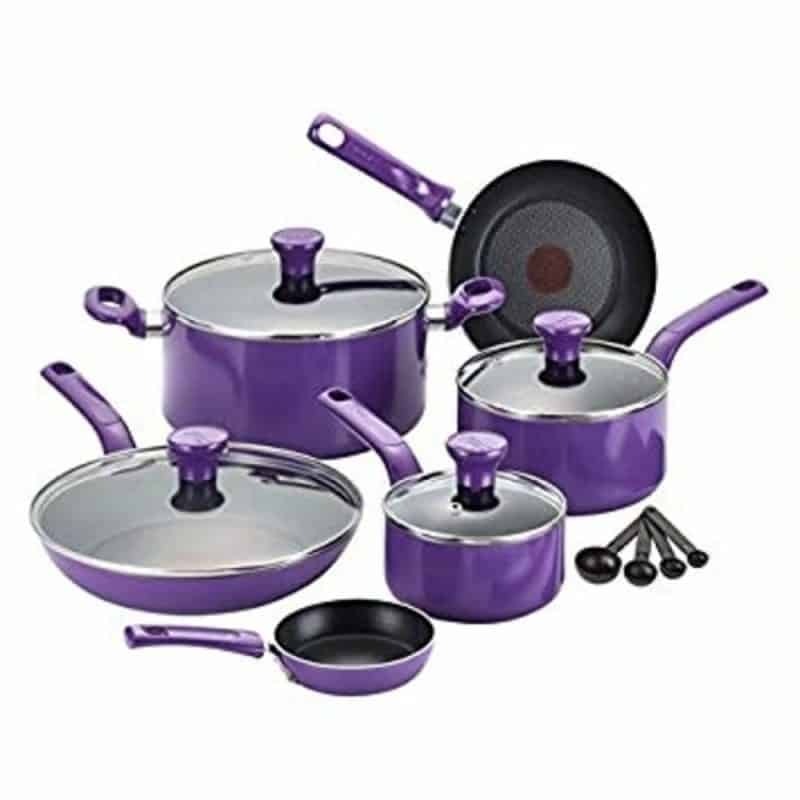 The KitchenAid Tri-Ply 10-Piece Set offers a stainless steel pots and pans set that is best for those with limited cookware as it includes six pots and pans total, along with multiple lids. The construction of this set is sturdy and heavy, and if heated properly when cooking, food should not stick to the surface. The domed, tempered-glass lids are not only aesthetic but help lock in moisture to give your food the most flavorful, quality cooking. Best of all, this cookware set is safe for all cooktops. Currently, this stainless steel cookware QVC offers is priced at $499.99, or you can make five payments of $100. 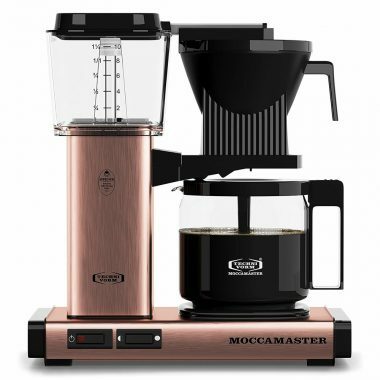 (You can also get this set on sale for just $399.99 on the KitchenAid website. However, act fast because the original price on their website is higher than at QVC.) With your purchase, you’ll also get a limited lifetime warranty. Overall, with an average of a 4.2-star review, one gets great value for their buck. However, there are some notable cons reviewers have mentioned. For instance, despite many saying this is a non stick surface, others seem to have problems with food sticking. Some also aren’t fond of the fact that the handles on these pots can be hot to the touch. But overall, users of this product are pleased. 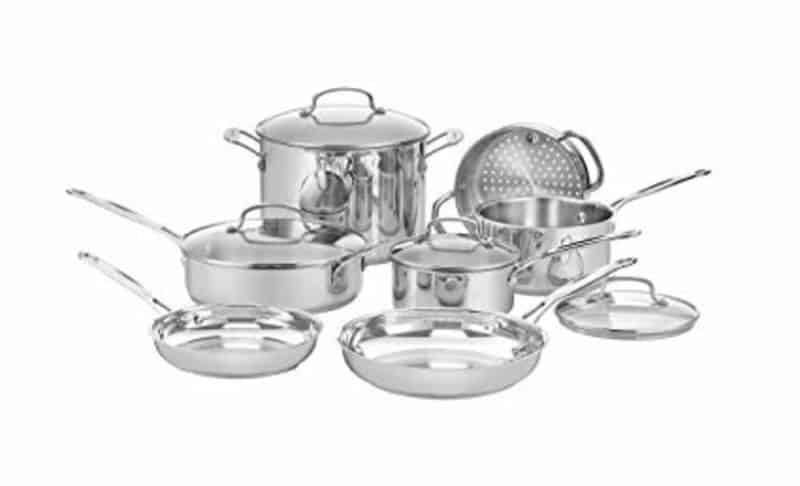 Next up, we have a 10 piece Stainless Steel Cookware Calphalon set. The impact-bonded aluminum bases of these utensils provide even heating and are capable of handling stoves, ovens, and broilers. With this set’s ergonomic handles, the user will not have to worry about getting burned while cooking as they stay cool to the touch. These pots also have fill lines to make cooking easier, faster, and less messy as the cook doesn’t have to dirty measuring cups. Apart from the product itself, one of the best benefits of purchasing this cookware set is that you get a lot for your money. Not only are you getting 10 pieces, including pot lids with convenient draining holes, you also receive a full lifetime warranty just in case something goes wrong with your cookware set. Caphalon have excellent customer service, so you can trust their warranty. The 10-piece cookware set is only $199.95 on Amazon or $294.34 if you want the 14 piece set version instead. But not so fast; let’s weigh in the cons. One of the biggest complaints is that this set isn’t very non stick as it claims to be. Other reviewers state that while the bottoms are thick, the walls of the pans are on the thinner side. While one will receive quality when purchasing Calphalon cookware, some do bring up the fact that the quality has diminished a bit over the years. The induction cooktop-, oven- and broiler-safe Cuisinart 13-Piece Stainless Steel pan set featuring sturdy, tempered glass lids is a great, 4-star purchase you’ll enjoy. This set is sturdy yet not so heavy to the point of inconvenience for most people. Its high impact bonded bases are said to heat up faster and provide even heating throughout, and its riveted handles are durable and easy to hold, and not to mention, stay fairly cool when in use. Additionally, the lids that come with this Cuisinart 13 piece set fit perfectly. Being glass, you can also peer into your pots without disrupting the cooking process. For under $170, the Cuisinart Professional Series 13-Piece Stainless pan set can be yours. However, keep in mind that this is not a non stick cookware set. For non stick utensil users, there may be an adaption process when using this set. Some users of this cookware set wish that there was a steam hole, which this set lacks. But overall, it’s a favorable buy. One of the new arrivals for this year, we’ve got the Tramontina set. This cookware set is slightly more on the pricier end at an original price of $349.97, on sale at Walmart for currently $210.99. 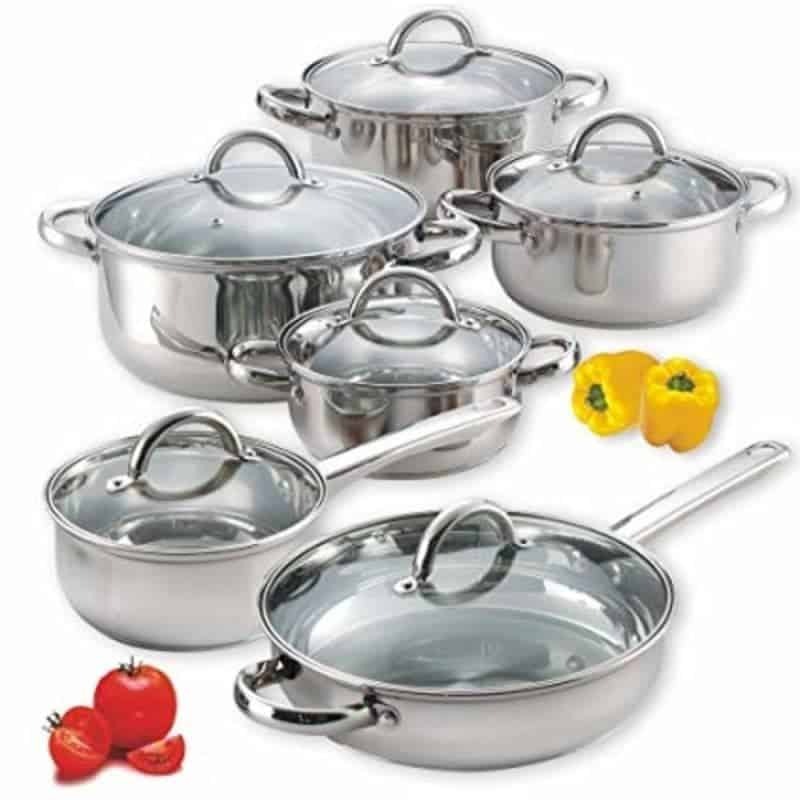 However, being made by the Brazilian brand Tramontina, the price isn’t a major drawback as this is one of the most popular stainless steel pot manufacturers to date as they offer higher-end sets. With an average of a 4.5-star review, it’s apparent that the quality of this cookware set meets customers’ expectations. As an example, there is proper heat diffusion throughout the entire pan and high-quality, ergonomic handles on each. The contents of this Walmart-exclusive set are also dishwasher safe and oven safe up to 500 degrees Fahrenheit, providing versatility for the user. But as a downside, one reviewer state that this 14 piece stainless steel pot set leaves marks on the bottom after cooking. Another, while overall they loved the cookware set, mentioned that there is a bit of discoloration that occurs when very alkaline and acidic foods are cooked on the pots and pans. However, in general, flaws and all, this set is favored among consumers. If you want one of the best stainless steel cookware sets for under $80, opt for the Farberware Millennium Stainless Steel 10-Piece Cookware Set. This set has received an average of a 4-star rating and has earned Amazon’s Choice. Featuring the most popular and commonly-used size of pans, this is a great set for newlyweds or others just getting started with purchasing cookware. This Farberware product features a total of six pots and pans and four glass lids that you can peer into to watch your food cook. This set is also safe in the oven and broiler up to 500 degrees Fahrenheit as well as in the dishwasher. While not advertised as a non stick set, reviewers state that these pots and pans are great at ensuring food doesn’t stick to the interior and get burned. As well as this, this stainless cookware set cooks food evenly. In terms of complaints regarding this cookware set, some state that the lids get pretty hot when in use. The bottom of the pots and pans also appear to get a little discolored overtime as well. Lastly, while Farberware claims that the handles are cool to the touch when cooking, others find that they still get uncomfortably warm. But priced under $80, you’re getting this set for a steal. By far, the Cooks Standard 10 Piece is the best stainless steel pans with a multi ply clad. 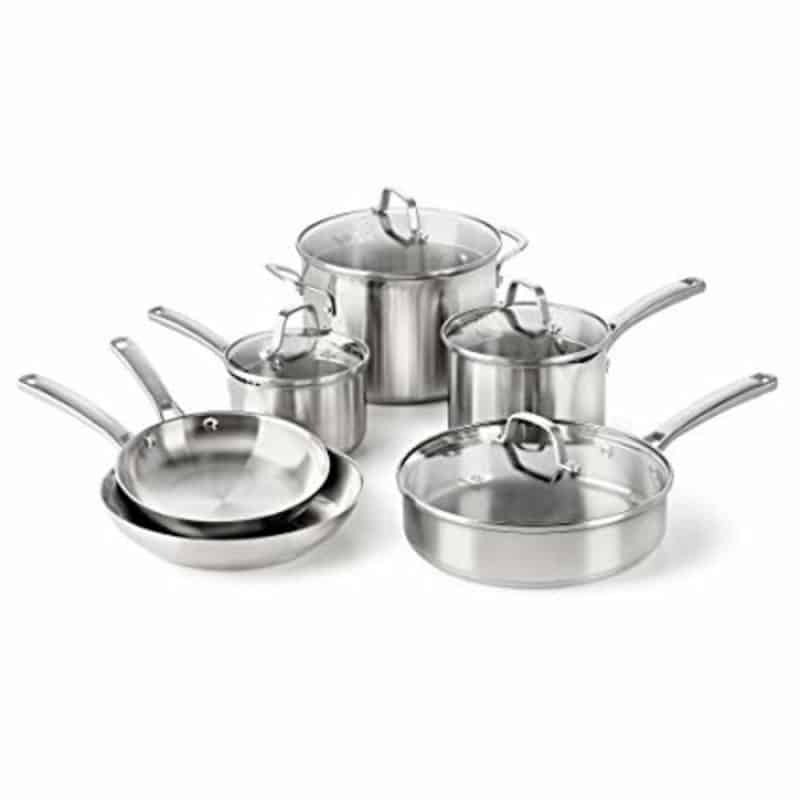 From its unique yet simple design to its overall function, this Cooks Standard set may be on of the best mid-ranged stainless steel sets around for under $200. Rest assured that this cookware set is oven safe up to 500 degrees Fahrenheit and is dishwasher friendly. To top it off (literally), the lids on the pots included with this set fit perfectly, and the handles stay cool as they are equipped with Cooks Standard airflow technology with a special V-shaped design. As for the pots and pans themselves, the three layers of clad metal they are constructed with make them durable, quick to heat, and top-notch at distributing heat. There aren’t many cons to say about this 4.5-star set. However, if there is any change that would be convenient, the lids being see-through would definitely help many users. This is something that multiple reviewers have brought up. But ultimately, this set works well and is easy to clean. Compatible with all stovetop surfaces, including induction, the Cuisinart Chef’s Classic Stainless Steel 11 Piece Cookware Set is a great buy worth every cent at its price range under $160. This set offers a clean, classic appearance with a gorgeous mirror finish. It also features sturdy, tempered glass lids that fit snuggly. You also receive a steamer insert for added versatility. 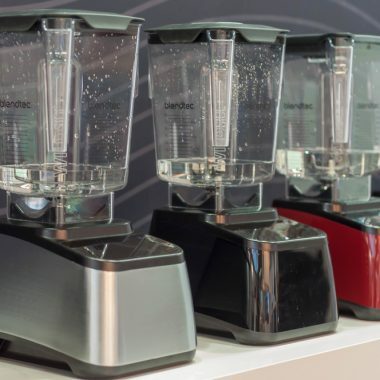 According to Cuisinart, their 11 piece stainless steel set will not rust. This is especially ideal as this set is considered dishwasher safe. The aluminum base off these pots and pans are designed to heat up quickly while keeping the handles cool to the touch. To top it off, there are measurement markings to help guide you with adding the right amount of ingredients to your pots when cooking. One thing to look out for, however, is that some state that this set is not all that easy to clean. One cheap even reviewed saying that the handles’ rivets on this set are on the cheaper side. Some even mentioned that food sticks and minor rust-like spots appeared after cooking. However, many of these cons are simple fixes with the right knowledge regarding stainless steel cookware as well as the right care. Hundreds are still pleased with the cookware set overall. The rounded-off, mirror-finished designed and enlarged handles on the Cook N Home 12-Piece Cookware Set, along with its transparent, ventilated glass lids makes this set quite aesthetic. With over 2,000 Amazon reviews, an average 4-star rating, as well as having earned Amazon’s Choice, this tells us that this product has more to offer than just a gorgeous exterior. With an aluminum disc on the bottom of each pot and pan, this allows for quick heating and the best heat distribution, all without worrying about hot spots. The riveted handles, according to Cook N Home, remain cool while the rest of the pot or pan stays hot. Generally, this is a heavy-duty, Teflon-free cookware set that most users find to meet their needs. But before you purchase, take a look at some of the cons. For one, some complain that the glass lids offer thinner glass. Others say that the handles on these utensils get hotter to the touch, even though they are advertised as cool-touch. But for an affordable price range of under $60 (currently $49.99 on Amazon as a price-drop), you still get satisfactory quality. Compatible with gas, glass, electric, ceramic, halogen, induction, etc. Last but not least, let’s feature another great cookware set but this time by T-fal. This set can be bought in four gorgeous colors, including: red, gold, blue, and purple (pictured below). Currently, each color is being sold on Amazon for under $65 (prices may vary) with a limited lifetime warranty included. These non stick utensils, while only oven safe up to 350 degrees Fahrenheit, are dishwasher friendly and offer ergonomic handles. But probably one of the best features about this set is that each pot and pan has a red dot in the center known as a Thermo-Spot. This spot turns solid red to indicate when your pot or pan is well-heated and ready to have food placed on it. The first thing I noticed that was a con right off the bat was the fact that this set only includes five pots and pans in total along with four lids. The measuring spoons (five spoons in the same device) count for the other five pieces this 14 piece cookware set offers. In a way, this was perhaps a little misleading. A second con is that a few reviewers said that these pots and pans scratch easily. But again, this set is under $65. That’s a great deal for something attractive, innovative, and of course, functional. Picking out the best kitchen utensils for your needs can be more of a technical process than some may expect. 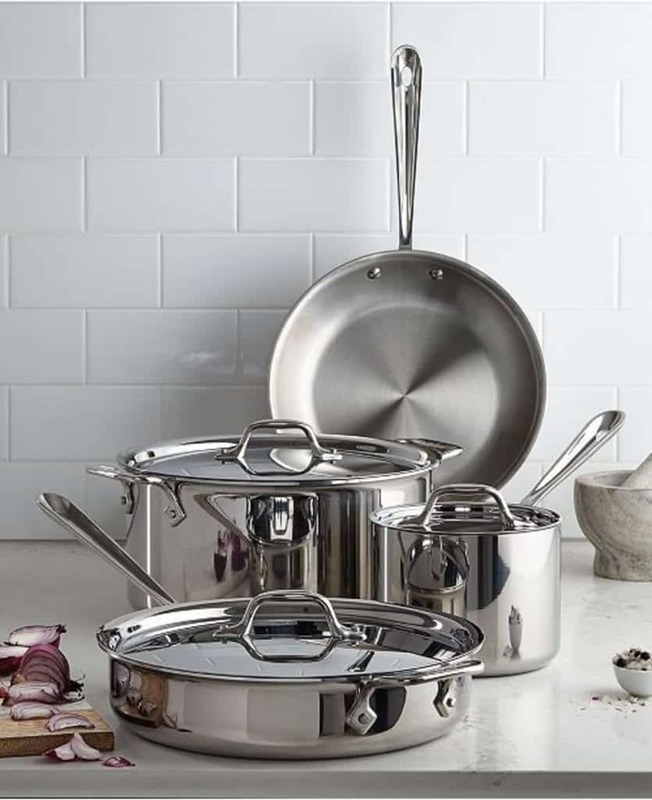 Sizes, materials, color(s), feel of the handles, features, and the like all make a difference in stainless steel cookware. Let’s look at some frequently asked questions that might assist in your buying process. 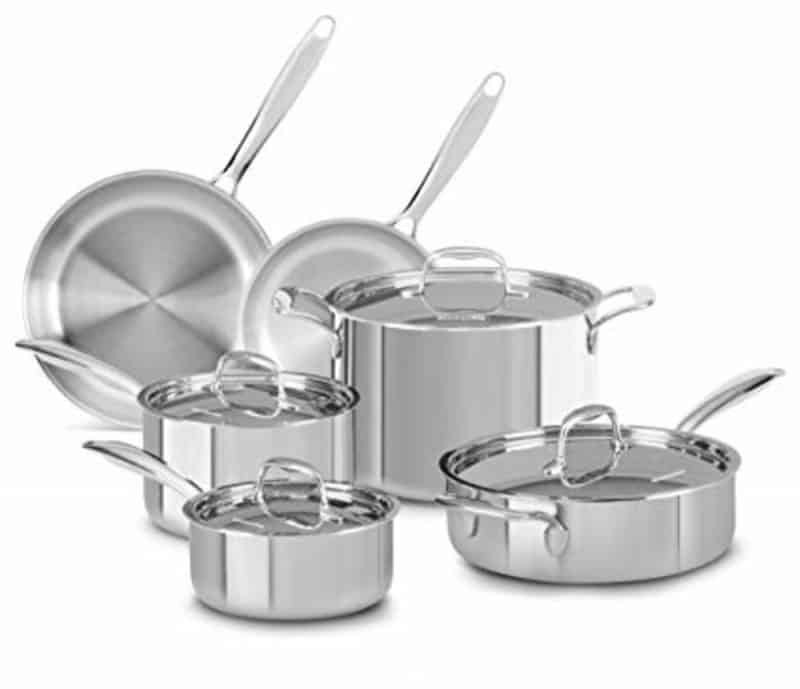 It depends on what you constitute as “safe.” If safe refers to not containing any toxins, then be aware that not all stainless steel pot sets are safe in this way. Are stainless steel pans oven safe? Most stainless steel pans are safe to put in the oven. But before assuming your utensils are oven safe, please check the box or manual your cookware came in. Most cookware has a maximum temperature that it can safely handle. Additionally, while the pans themselves may be able to be placed in the oven, their lids may not be. Is stainless steel cookware non stick? Not every cookware set contains non stick pans. For the ones that do, they tend to be lighter in weight and more affordable. But there are higher-end, more durable non stick options as well. When to replace stainless cookware? Before assuming your stainless steel cookware needs to be replaced, make sure to thoroughly clean it first. Looks can be deceiving. Using a bit of warm vinegar can clean up stains nicely. (Yes, even “stainless” steel can get stains!) If that doesn’t work, try using vinegar, water, and baking soda and then heating it up. Some stains may require a bit of scrubbing or scraping. Are stainless steel pans dishwasher safe? Putting it in dishwasher is said to be safe, but always check your cookware’s manual or box just to double check. How long does stainless steel cookware last? Good stainless steel cookware should last you a long time. I’m talking decades. Many cookware sets even have lifetime warranties as they are designed to last several years before showing signs of wear and tear. Good care is essential, but never assume your cookware is fine just because you only had it for a few years or so. Low-quality, improperly cared for cookware will need a quicker replacement. How to store stainless steel cookware? Before storing your cookware, make sure your set is clean and free of stains. Do a brief inspection to verify your set is still safe to use. Make sure your pans are completely dry before storing. 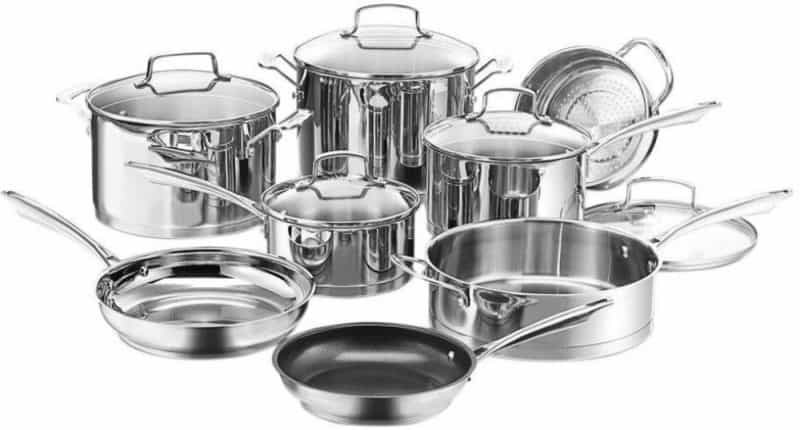 If you have pure stainless steel cookware that’s high-end, refrain from stacking your pans. Instead, hang your cookware up, or store them in special cookware racks or shelving where they aren’t stacked. This can reduce the risks of scratches. Will stainless steel cookware work on induction cooktop? To use your stainless steel pots and pans on an induction cooktop, it will need to be made of magnetic-based materials. 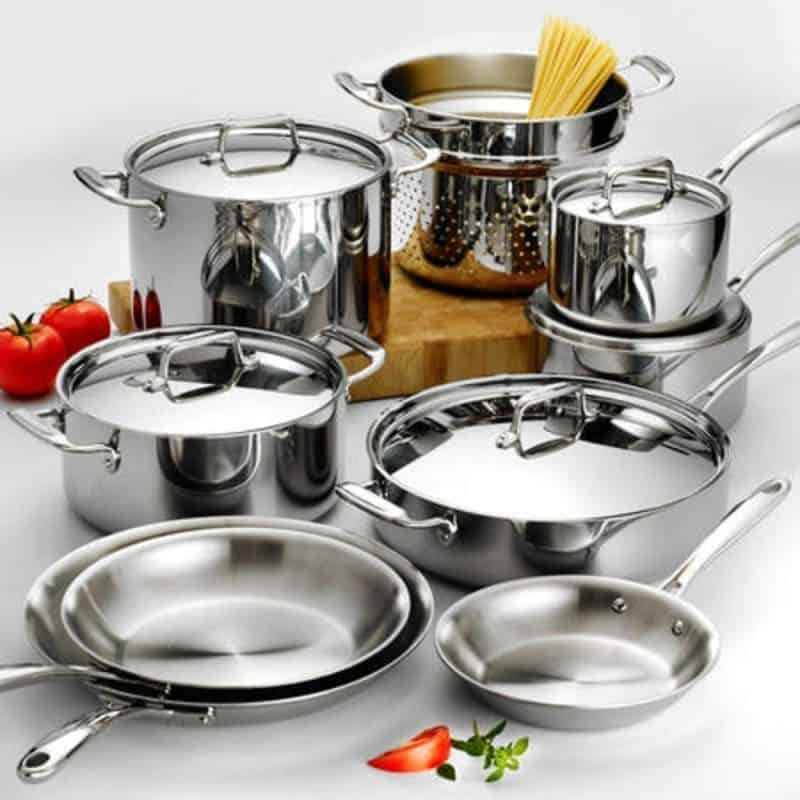 Full-clad cookware will work, such as cookware from All-Clad which offers some of the best stainless steel cookware for induction stovetop surfaces.